The federal government has closed the book on what was once called the Canadian Wheat Board. 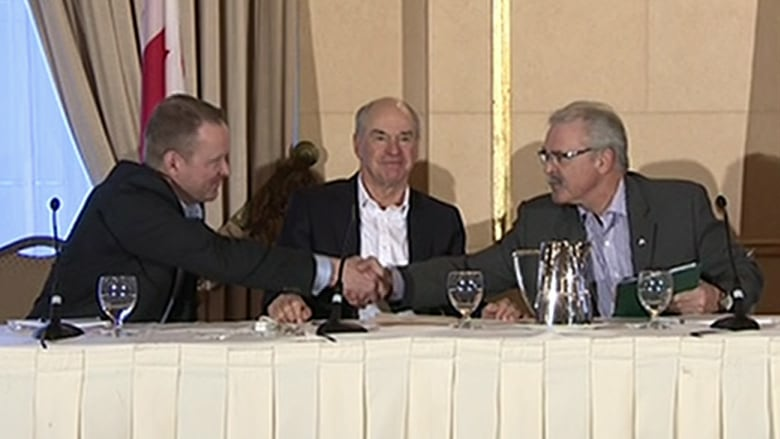 Agriculture Minister Gerry Ritz says Ottawa has finalized the sale of the agency that marketed grain for western Canadian farmers since 1935 to G3 Global Grain Group. G3 says the board, known recently as CWB, will be combined with Bunge Canada to form a new company called G3 Canada Ltd.
G3 CEO Karl Gerrand says the name change is a step toward building a highly efficient coast-to-coast grain handling company. The federal government announced in April that G3, which is partly owned by Saudi Arabia, would buy 50.1 per cent of the board for $250 million. It said the rest would be kept in trust for grain farmers, but in seven years G3 has the option to buy back the units from farmers at market value. "The commercialization of the CWB has been part of the government's broader modernization of Canada's grain sector to stimulate investment and create jobs and economic growth for farmers and Canadians," Ritz said in a release Friday. "We have a new entity created from this combination, and so G3, going forward will be our brand," Gerrand said. "This is a Canadian company run by Canadians who are interested in building a long-term relationship with the grower." Prairie farmers going as far back as 1935 used to sell their wheat and barley to the board, which in turn exported it to foreign markets. Despite several lawsuits and vocal opposition from some farmers, the federal government went ahead three years ago with a long-standing promise to abolish the board's monopoly. A group called Friends of the Canadian Wheat Board hasn't given up the fight. Lawyer Anders Bruun said Friday the group is to be in Federal Court in Ottawa this fall in a bid to have a class-action lawsuit against the federal government certified. The group contends that Ottawa mismanaged about $720 million that should have been paid to grain farmers from the 2011-2012 crop year. Bruun said changing the wheat board's name to G3 Canada won't affect the lawsuit. "The liabilities of a corporate entity carry forward," he said. "G3 doesn't just get the assets; they get the liabilities." "The objective of the Saudis will be to get grain as cheaply as they can from Prairie farmers," he said. Ritz said a G3 affiliate called G3 Global Holdings is examining the feasibility of developing a new port facility in Vancouver to ship grain. He said that would greatly increase Canada's export capacity. About 70 per cent of western Canadian grain exports already flow through the West Coast. G3 Canada says that, with the sale, it now controls assets from Leader, Sask., to Quebec City that include inland grain and port terminals, grain hopper rail cars and a fleet of Great Lake grain transport ships.